The Avg. Group Saves 5.2%! Bryce Canyon, Capitol Reef, Freemont Indian State Park, Paiute ATV Trail, Fish Lake, Otter Creek. Welcome to the Comfort Inn, a Richfield hotel near Snow College Richfield Campus The Comfort Inn® hotel is conveniently located near many popular attractions, including Snow College Richfield Campus and Cove View Golf Course. Fremont Indian State Park, Fishlake National Forest and Capitol Reef National Park are an easy drive away.The Utah Army National Guard, Reynolds Municipal Airport and Sevier Valley Hospital are also located nearby. World-class ATV trails are adjacent to hotel. A Wendy's fast food restaurant is located on the premises.Guests of this Richfield hotel will also enjoy amenities like free local calls, free weekday newspaper and the free deluxe continental breakfast featuring an assortment of biscuits and country sausage gravy, freshly baked Belgian waffles, pancakes, scrambled eggs, beacon, bagels, English muffins, doughnuts and hot and cold cereals. The hotel also offers an exercise room, indoor heated pool and hot tub. Yes,We are know participating in the Clean the World's Green ProgramRecycling soaps, shampoos, and conditioners. We have installed all LED lights and low flow water showerheads throughout the hotel and have 5 recycling bins thorough out our hotel. Lounge/Bar Hours: Accross the Street. 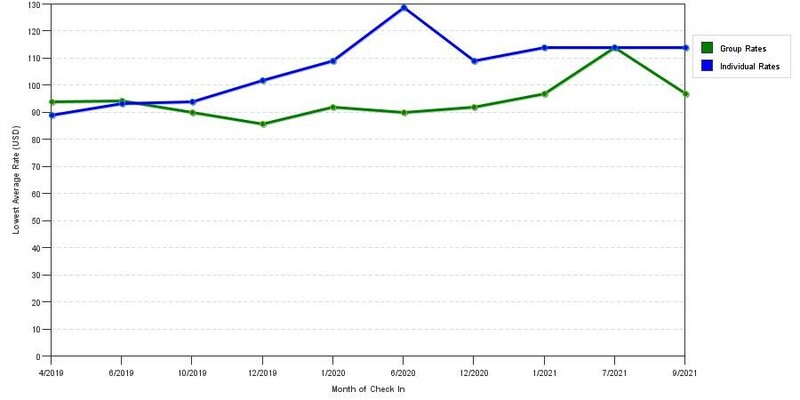 The chart above shows averages of prices for both our group rates and the best individual traveler rates our system could find at the time the group bid was placed. The best group rate shown is 29.0% in January 2017 and the highest average individual rate is $165 in the month of June 2017. This chart will show past seasonality and also project future months. If you are flexible with dates, you may want to consider staying at Comfort Inn in a month when rates are lower.